I know this soup looks entirely like winter, but I’m not convinced that soup should have a season. Plus, if we’re honest, spring hasn’t been super committal this year. It’s somewhere between 50 degrees and 87 degrees every day. So, my California wardrobe feels confused. Do I wear a sweater, or is this fog going to burn off– leaving me to sweat like an Easter ham? Do I gamble and wear a dress? Or, is it going to start raining–leaving my laboriously shaved legs to goosebump and become spiky once again. It’s confusing to be in your thirties and feel like you’re not able to dress yourself correctly. At least we have soup, you guys. I get soup. I understand soup. Soup’s not going to make me feel like an idiot for wearing this sweater. I love you, soup. I really do. Not only is this soup kind and understanding (it’s cool if I personify my food, right? Maybe? No?) but, it’s incredibly simple to make. It only has a few ingredients and it comes together in a little over thirty minutes. 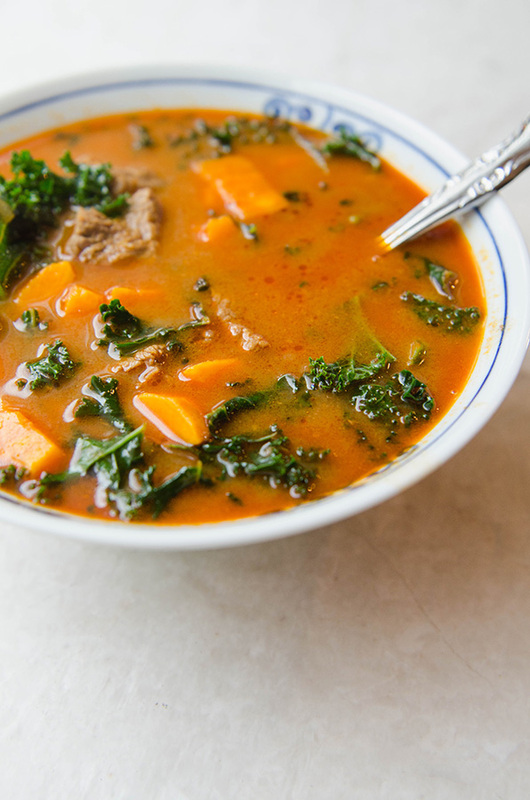 You need those thirty minutes for the flavors of the curry, coconut and tomato to mingle with the sweet potatoes and the beef. It’s a hands-off thirty minutes. You can do whatever you’d like. Answer e-mails, give yourself a face mask, watch part of an episode of Fixer Upper (don’t pretend like you’re not watching it while wistfully considering moving to Waco, Texas–because, we can just knock down walls and add a farm sink). 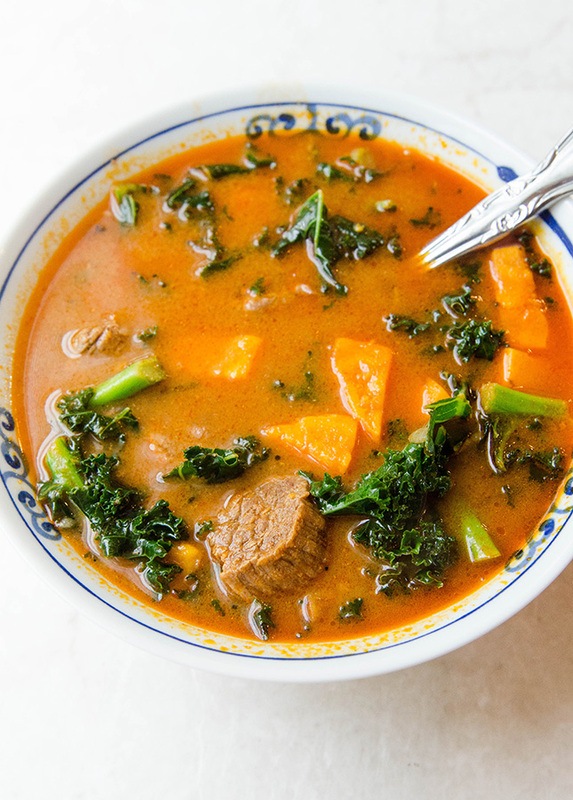 The end result of this soup is creamy, comforting and bursting with curry flavor. I like to add a little squeeze of fresh lime to my bowl before I go all crazy soup monster on it. It adds a nice hint of acid to balance out the sweet and savory. Plus, there’s kale in here. It’s a pretty much a salad. Now, excuse me while I try to decide whether or not I should wear a chunky knit today. Let’s all gather around the virtual water cooler and say things like “This weather we’re having. Amiright?” or “Dang, my seasonal allergies are crazy!”. I’m so glad you’re on board. Don’t worry, I’ll being a thermos of soup. Meet you in the break room. In a heavy bottomed soup pot, heat up the ghee over medium to high heat. Add in the shallots and the garlic, and saute until the onions have softened a bit. Add the beef to the hot pan, and spice it liberally with salt, granulated garlic and black pepper. Add in the red curry paste, curry powder, cumin, ginger and cinnamon. Stir, and continue to brown the meat. Once the meat is nicely browned on all sides, add in the sweet potatoes. Allow them to cook with the beef for a couple of minutes before adding the broth. Add in the beef broth, tomato sauce, and can of coconut milk. Stir. Bring the pot to a simmer, and allow it to simmer for at least 30 minutes on the stove. Once it's finished simmering, add in the kale. Allow the kale to soften in the pot. This will only take a minute or two. 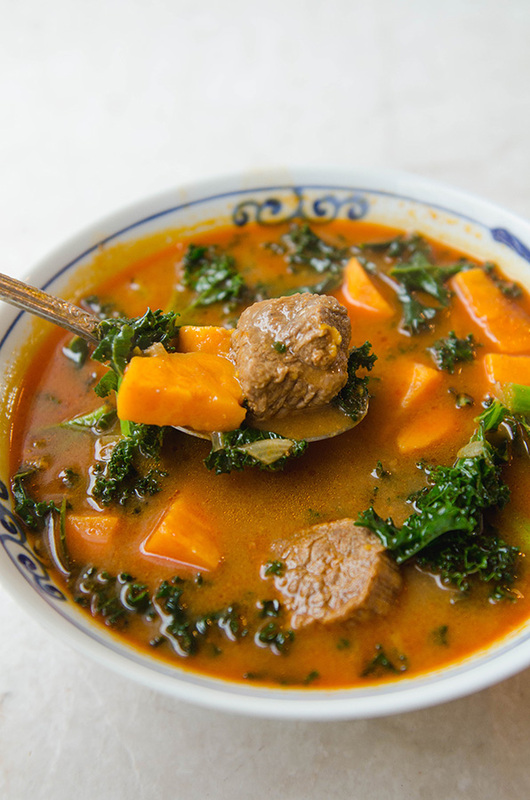 Once the kale has wilted, the soup is ready to serve! Squeeze a lime wedge over the top for a little extra acid. Enjoy! I just got an Instant Pot and this looks like it would work really well in there. Do you have one and if so are there any modifications I would need to make to the method?